DOWNTOWN DISNEY WAS RENAMED AS “DISNEY SPRINGS” IN SEPTEMBER 2015. 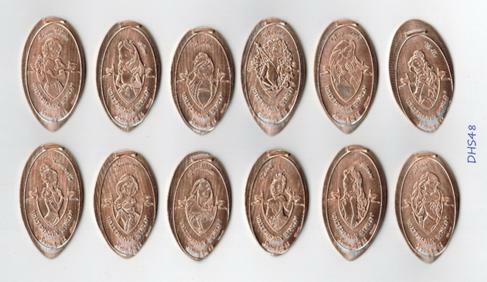 Set of 4 pennies pressed on copper cents from the machine added in 2018 at the Firehouse (which is a restroom building). Another machine added in 2018 – this time, the machine popped up in the food truck area. Culinary themes: Minnie Mouse with ice cream cone; Dopey eating cake; Chef Mickey carrying sandwich; Goofy with turkey. All pressed on uncirculated copper cents. This machine was moved in June or July 2018 from the In Character store at Hollywood Studios to the Disney Corner store in Disney Springs. 4 dies replaced prior designs in August 2017. The old dies had characters from The Incredibles and Cars. The new dies have Buzz Lightyear, Mickey Mouse, Nemo with Dory, and a little green alien from Toy Story. A new 8-die machine, finally delivering a Nightmare-themed set to Disney World! The machines supply pennies – shiny zinc pennies. As a result, copper cents are not available. A new store at The Landing, with a new 8-die machine installed in May 2016. 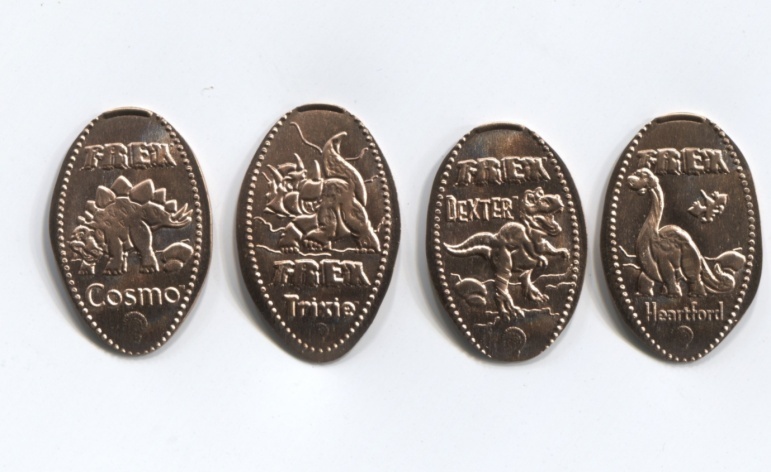 The machine supplies pennies – shiny zinc pennies. 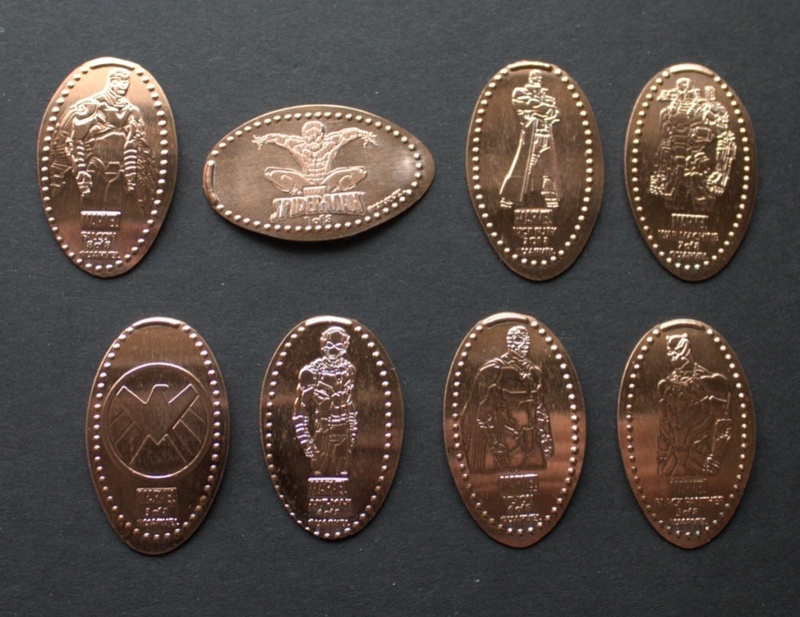 As a result, copper cents are not available. This machine was originally located at Wandering Oaken’s Trading Post (at Hollywood Studios) as a temporary showcase for events and souvenirs from the movie. The designs at this location duplicated designs that were available elsewhere. Although the attraction was closed, the machine was moved to Prop Shop and then later retired in 2016. It was brought back to life in December 2016, though, when the machine was placed at the Pin Traders store at Disney Springs. 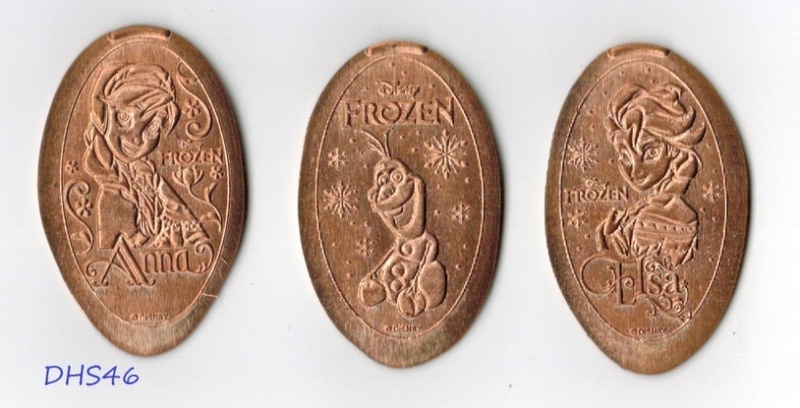 All three coins are from Frozen: Anna, Elsa, and Olaf. 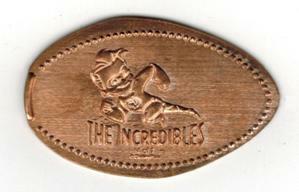 This machine started at Hollywood Studios (Mickey’s of Hollywood), where it featured three Incredibles designs. Syndrome was retired, replaced by Olaf. The Mickey’s of Hollywood machines were moved to other locations (Pizza Planet and Prop Shop). When those areas were closed for park expansion, this machine was retired. Retirement did not last long, however – the machine was installed in Pin Traders at Disney Springs in 2017. This machine was also retired in 2016 when construction closed Pizza Planet, but the dies popped up in 2017 at Pin Traders. 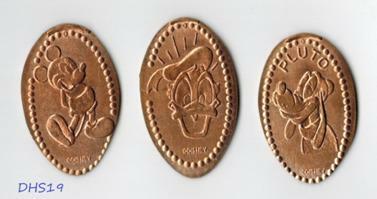 3 pressed pennies originally from Pizza Planet at Disney's Hollywood Studios. Designs: Maleficent (Villains series); Violet (The Incredibles); and Guido (Cars). This machine was retired in 2016 when construction overtook Pizza Planet. The machine returned in December 2016, though, when it was placed at the Pin Traders store at Disney Springs. This store was renamed as the Star Wars Trading Post in 2017. It had previously been known as Pooh Corner. Designs: Disney Spring logo; Mickey Mouse; Goofy; Minnie Mouse. The characters are in the same poses as the designs previously at this location (with the Downtown Disney logo – set #DTD03). A new 4-die machine was added in February 2015. This machine was retired when the store switched to the Star Wars theme. This machine was retired in October 2015, making way for new designs featuring the “Disney Springs” name (set #DTD22). Designs: Downtown Disney logo; Mickey Mouse; Minnie Mouse; Goofy. 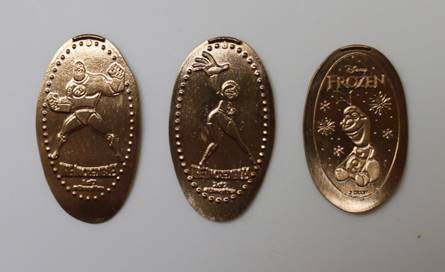 The three character pennies all have Downtown Disney markings on them. There are 4 machines at the Rainforest Café. 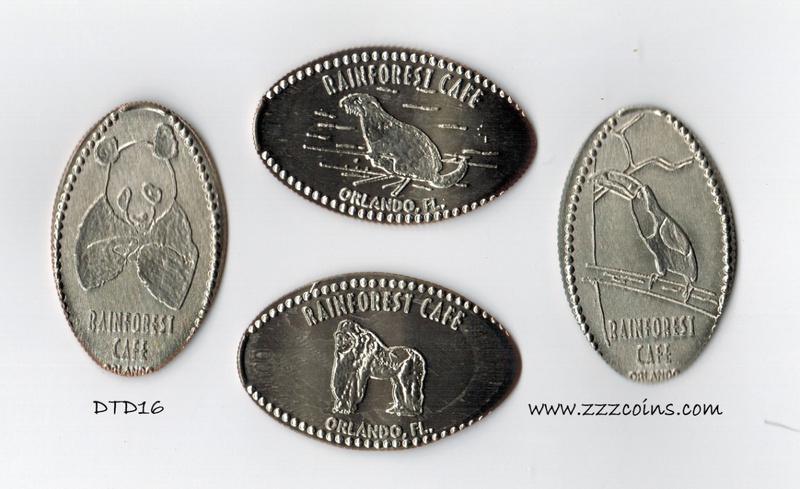 The coins do not mention “Disney,” but have “Orlando” on them. 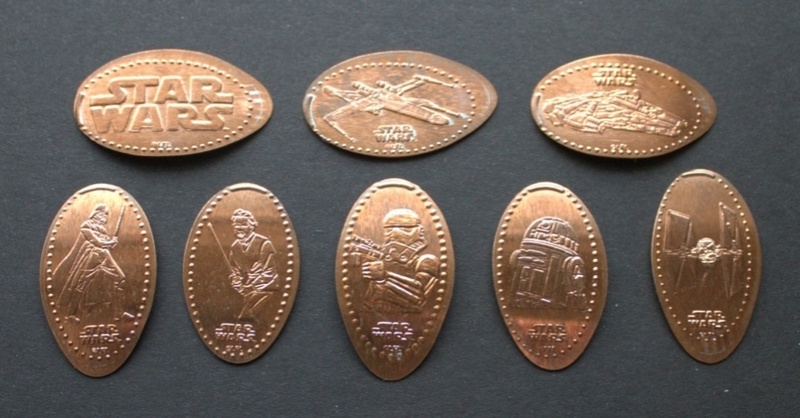 These designs differ from the Animal Kingdom pennies. 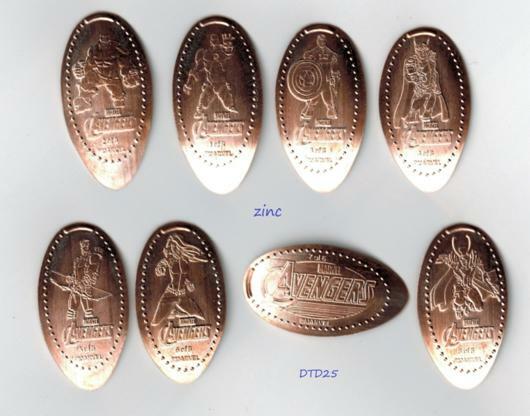 Presscoins numbers DTD0046-0049 (quarters); DTD0058-0061; DTD0082-0089. 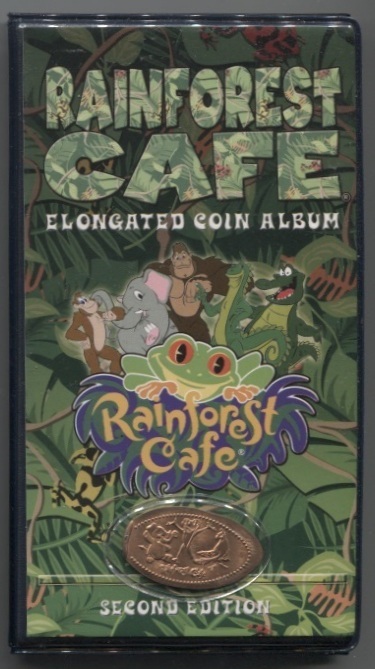 Also available: Rainforest Café second edition pressed penny book. This is the generic book used at all Rainforest locations. 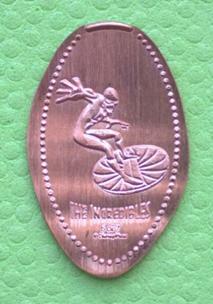 It has a pressed penny (not otherwise available) in the cover. Holds 36 pennies and 8 quarters. The T-Rex Cafe is a family restaurant with a dinosaur theme; it is owned by the same company that runs the popular Rainforest Cafes and the Yak & Yeti restaurant at Animal Kingdom (Landry’s, Inc.). There are two T-Rex cafes in the country: one in Kansas City, Kansas, and the one at Downtown Disney. 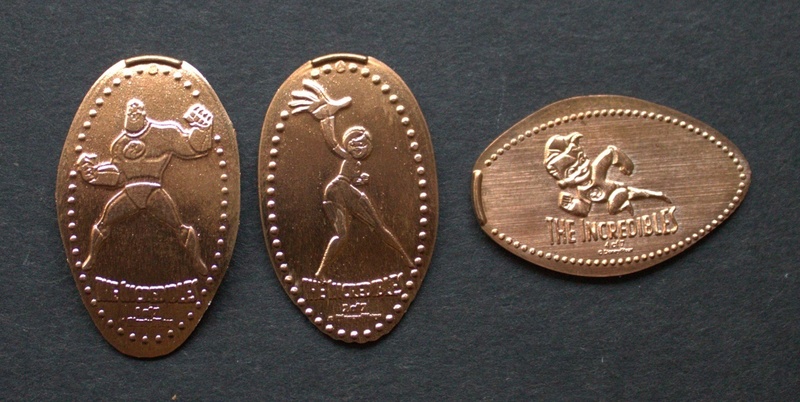 The two locations have different penny press machines. There are two 4-die hand-crank machines. This listing has all 8 designs from the Downtown Disney location. from the Cars numbered series: Mater (#2 of 9); Ramone (#5 of 9). This machine was retired in January 2016 but returned in September. It was retired again in 2017. Three new machines were added in October 2018. All are 8-die machines that automatically dispense zinc coins. These replaced three hand-crank machines. The three 4-die World of Disney machines were all retired in October 2018. 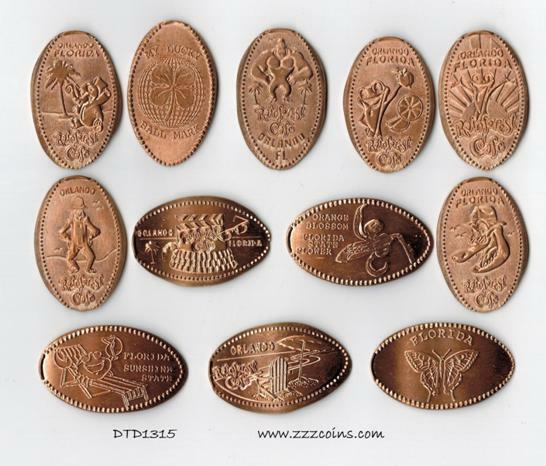 Set of 8 pennies pressed on zinc cents supplied by the machine. This machine was added in 2016 at Once Upon a Toy, and moved to World of Disney in August 2017. This machine was added in February 2015 and retired at the end of 2017. The designs do not mention "Disney.” They feature various Cirque acts and characters. La Nouba closed on December 31, 2017 and the building is being remodeled for a new Cirque show that is more Disney-centered. With the closure of the show, these La Nouba designs have been retired. Disney Quest closed in 2017. 6 Wreck-It Ralph pennies – these machines have been in five different locations! 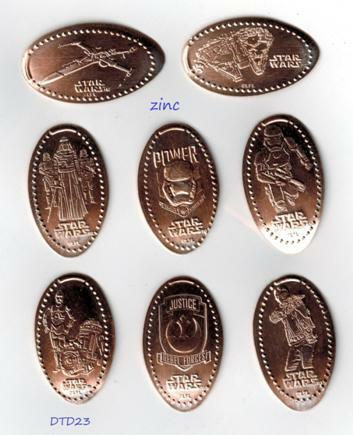 Complete set of 6 Wreck-It Ralph pressed pennies. Two machines were added in early November 2012 to coincide with the release of the film. Designs: Wreck-It Ralph logo; Fix-It Felix Jr., Sgt. Calhoun; Ralph; Vanellope; King Candy. Two machines were added to the Pizza Planet arcade, but they were later moved to the Prop Shop, and then to the Magic of Disney Animation area. In 2014 these machines were moved to Downtown Disney, at Disney Quest. In 2017 they moved to the Art of Animation resort when Disney Quest closed. This machine used to be located near the first-floor exit, and then inside the gift shop, and then it was moved to the second floor. 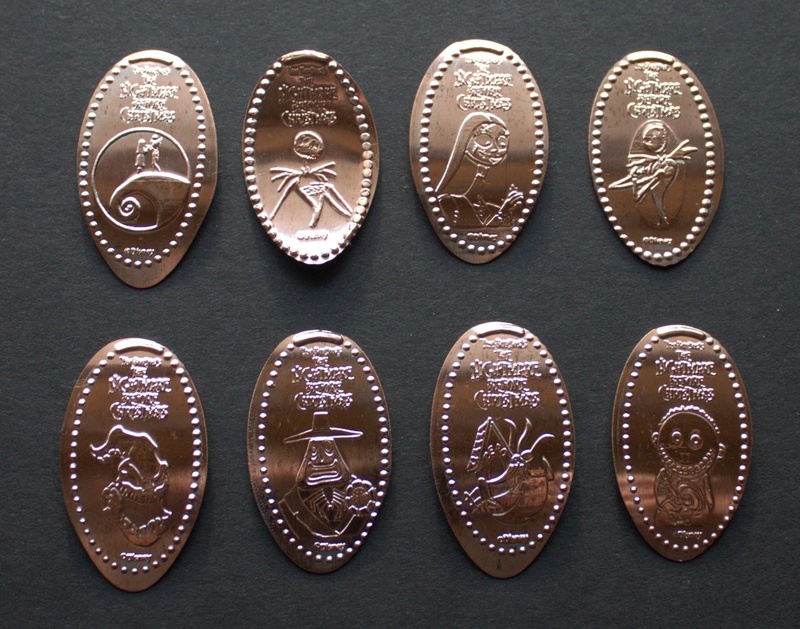 Two Disney Quest machines have coins with the Disney Quest logo. They appear identical – but they are different. Here’s a guide to help you. As of early 2016, House of Blues is the only WDW location to have a single-die penny machine. There are still a few single-die quarter machines. House of Blues also has the only current coin press in the West Side section of Disney Springs as of January 2018.